It's possible you've biked or jogged past it. 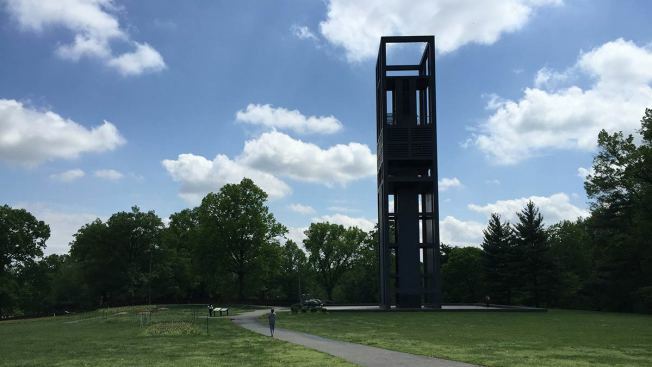 The Netherlands Carillon is a little-known structure with a towering view of Washington D.C.'s monuments -- and right now, it's in need of some major repairs. For more than half a century, the 127-foot-tall carillon has stood on Arlington Ridge between Arlington National Cemetery and the United States Marine Corps Memorial (also known as the Iwo Jima Memorial). The carillon's 50 bells, the most recent added in 1995, chime throughout the hour, and the path in front of the carillon offers an incredible view of D.C., including the Lincoln Memorial, the Washington Monument and the U.S. Capitol dome. An observation platform at the Netherlands Carillon in Arlington -- once open to the public -- has been closed for several years now due to its deteriorating condition. 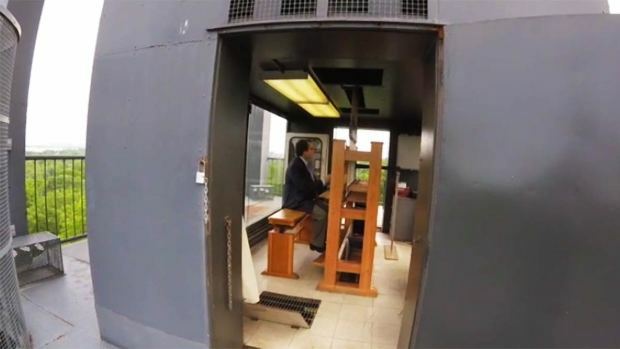 The only person allowed up, aside from NPS officials, is the carillonneur, who plays the chimes and bells on a keyboard similar to an organ or piano. Here, carillonneur Edward Nassor rings the bells. News4 was offered a TV exclusive tour to the observation deck of the carillon, where National Park Service (NPS) guides pointed out some of the structural repairs badly needed. Along the carillon's exterior, water has corroded around the bolts and caused the structure's shell to noticeably peel off. "It really shows what's happening here at the carillon," said Aaron LaRocca of the NPS. "So you have a protective paint here that's failing, because it hasn't been painted in a number of years.... What we're seeing here is the deterioration of the skin [and] what we're concerned about are the bones." An observation platform that was once opened for the public to summit has been closed for several years now due to its deteriorating condition. The only person allowed up -- aside from NPS officials -- is the carillonneur, who plays the chimes and bells on a keyboard similar to an organ or piano. "Our hope is once it's restored or rehabilitated that we can allow access to the top viewing platform," said Alex Romero, superintendent of the GW Memorial Parkway of the NPS. The structural repairs would cost some $2.7 million and would take about two years to complete. Once funding is in place, officials hope to do a full assessment to determine how deep the corrosion goes. That will also determine the extent of the repairs needed. The assessment will also be able to help officials figure out whether the viewing platform is structurally sound to be reopened to the public. The Trust for the George Washington Memorial Parkway is hoping to raise money for educational aspects of the project. "Our goal is to bring back that educational component, bring back the life in the park," its chairman, Duncan Blair, told News4. "By doing that then you create a donor base to help sustain it." The carillon, a gift from Queen Juliana of the Netherlands, was given to the United States in 1952 as a sign of gratitude after World War II. "It was moved here in 1960, and it tells that story of 'thank you,' a story of gratitude," said Romero. The Dutch see it similarly. "We were liberated by the Americans and the Canadians," said Ambassador Henne Schuwer of the Royal Netherlands Embassy. "And this was our gift to the American people to say 'thank you' for liberating us." Seventy years after World War II, Schuwer hopes eventually more visitors will make the carillon a destination -- if anything, to remind future generations of the past. "We have to tell, especially the younger people, that it is not a given that we live in a free world like we live [in] today. That you have to defend that freedom... we're doing that," Schuwer said. Thursday marks the Day of Remembrance on which the Dutch reflect and honor the lives lost fighting in WWII. On Friday, they will celebrate the role the United States and other Allied nations played in liberating the Netherlands. Go here to find out when you can hear the Netherlands Carillon's bells chime.